...targeted, intensive efforts supported by technical assistance and accountability for data and reporting can ... increase screening rates among uninsured and underserved populations. A new study suggests that an American Cancer Society program has been effective in promoting improvements in colorectal cancer screening rates in federally qualified health centers (FQHCs). The study appears early online in the American Journal of Preventive Medicine, and the authors say it has implications for broader public health efforts to increase cancer prevention and screening. In 2013, ACS initiated the Community Health Advocates Implementing Nationwide Grants for Empowerment and Equity (CHANGE) grant program, which was designed to reduce breast and colorectal cancer screening disparities by building community capacity to implement evidence-based interventions proven to increase cancer screening rates. Funding is awarded to FQHC partners, with technical assistance provided by ACS field staff. Funded FQHCs were required to implement at least one provider-oriented strategy (provider assessment and feedback or provider reminder/recall systems) and at least one client-oriented strategy (education, client reminders, or navigation). Most grantees (88.4%) implemented three to five intervention strategies throughout their funding period. Investigators compared screening rates of FQHCs funded by CHANGE grants to those of matched controls. At the start of the study period, colorectal cancer screening rates were low across the board, with funded FQHCs lagging nonfunded FQHCs (26.4% vs 30.4%). 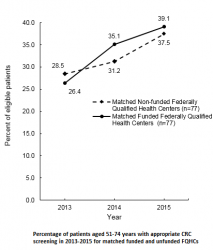 In the first year (2013-2014), funded FQHCs increased their CRC screening rates significantly more than nonfunded FQHCs. Funded FQHCs increased by 8.7% (from 26.4% to 35.1%) while nonfunded FQHCs increased by 2.7% (from 28.5% to 31.2%). Across the three years, increases were 12.7% (from 26.4% to 39.1%) and 9.0% (from 28.5% to 37.5%), respectively. The difference in change rates between groups across the 3 years was not significant. Article: Evaluation of Colorectal Cancer Screening in Federally Qualified Health Centers, Am J Prev Med 2017; DOI 10.1016/j.amepre.2017.10.007.